"in the past 3 years, scams in 27 states used the name of God to rip off $1.9 billion." In some ways I am tempted to believe that saying: It is morally wrong to allow a sucker to keep his money. There is certainly a bit of truth there. Also, one might argue that the religious scammer is actually providing people with some sort of comfort, so the money they give is not for nothing. There's some truth there, too. But I believe that there are many people who would not give these liars one penny, if they knew that their favorite evangelist is in reality a wolf, dressed in the garments of a sheep. And so, this phenomenon seems to me to be a worthwhile subject for discussion. Therefore, I begin. "Rev. Peter Popoff, People United for Christ founder, has utilized every media to communicate the supernatural Good News of Jesus Christ and the power of the Holy Spirit to a lost and dying world. He has exploded onto the Christian scene with an energy for the supernatural and the miraculous move of God to heal and save millions of people around the world. In fact, he has preached around the world, in many crusade services where over 10,000 have come forward in one service to receive Jesus as their personal Savior." Sounds quite legitimate. Perhaps you want to purchase his "Divine Transfer Kit," which he will gladly send to you as soon as you hand over a "love gift of $89.99." There are 15 items in the kit, one of which is a "Beautiful Cross Necklace Personally Brought Back From Israel By Rev. Popoff Filled with Holy Land Soil and Water." Wow. That sounds good. What's more, if you turn over your contact information to Rev. Popoff, he will send you some of his "Miracle Spring Water!" I'd say that's a great deal. For Rev. Popoff. And if you make a donation online, you can rest assured that "your seed is being sown into good ground and will be used to bring the Word with simplicity and power to the whole world. God bless you for being obedient!" If you still aren't convinced to fork over your hard-earned cash, just read a few Financial Testimonials. Brother E. Sotomayor, from Bronx, NY writes, "I received the miracle spring water and the blessed cakes in Jesus' name. Everything around me and my family is different. Blessings have been occurring. You were not wrong; it was a $17,000 loan that was granted to me to pay off most of my debts. You're a guiding light. I thank the Lord for your prayers. I see myself now walking in the right path." I'll tell you, I'm starting to feel a lump in my throat. Wait, now it's in my mouth! If you happen to contact Rev. 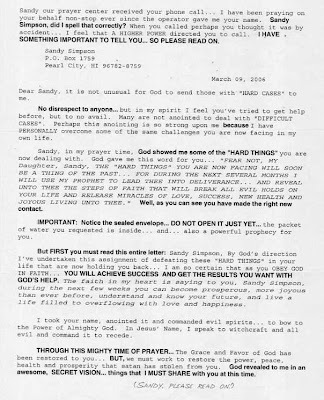 Popoff, or even if you don't, you might get a letter like this one. Still not moved to pull out your wallet? Don't worry, there are many others who will be. So fear not, the Rev. Popoff will continue to do just fine.